Who doesn’t love summer time? The sunshine and warmer temperatures, the family vacations, the lack of school homework, and of course, an evening on the porch sipping a refreshing iced beverage. You’d think we would find ourselves outdoors more enjoying creation. Often times though the opposite is true and we end up spending more time looking at our screens during the summer than we do the rest of the year. Summer time can also be a cruel welcome to reality. As kids we look forward to summer time because school is out and we get to play. As adults we realize that summer time is no different from any other time of the year – we still have to work and life goes on as normal. That makes it easy to use screens to keep our kids entertained during those long summer days. Fortunately, the good folks at Microsoft have built some pretty cool tools into the Windows operating system to make it easy for families to manage their screen time. While other software vendors also have family safety built into their products, Microsoft does it in a unique way that allows for native, remote control over your family’s computers without having to install or manage any additional software. Windows Family Safety is a fantastic tool built right into all versions of Windows. Windows 10 has the most features available but Family Safety is still available all the way back to Windows 7. Using Windows Family Safety, you can set filters and block lists, control access time windows and set curfews, track device location, and even get a detailed report emailed to you about all activity taking place with the computer. Not only is Windows Family Safety a powerful tool, it is also easy to use and Microsoft has done a great job providing helpful documentation. All it takes is a few clicks and you will soon be monitoring all of the Windows devices in your family. One feature that sets Windows Family Safety apart from other filtering or block services that are built into some operating systems is that you can remote control the settings. Once setup on the computer, the parent can change settings remotely without having to touch the kid’s device. This allows mom and dad to control the device from anywhere. It also allows the child to request additional privileges and mom and dad to approve the request via email. The content rating and restriction tools are most effective. If you already have content filtering setup on your home network, Windows Family Safety works right along with it. 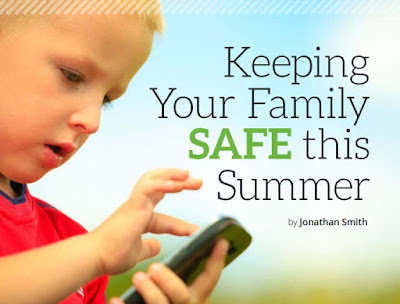 Then when the child takes their device to a friend’s house or other location where the internet might not be filtered Windows Family Safety keeps doing its thing so you know wherever the device is the content is filtered and your time limits and curfews will still be enforced. You can also set it up to send you a weekly activity report of each child’s activity. The report shows you which devices the child used, what they searched for on the internet, how long they used each app, the total amount of time they spent on the device, and any content that they attempted to access and was blocked. This is a tremendous accountability tool – especially when you see what they are searching for online. If the device is lost or stolen, you can also use Windows Family Safety to track the last known location of the device and disable it to protect your child’s personal information. The goal here is not to be oppressive but to use this tool to help teach them to live a godly life, both online and offline. As the child grows and matures you can use Windows Family Safety to provide additional online privileges – Windows Family Safety works from the youngest of kids to the oldest of adults. It can even be used for adult accountability. All you need to get started is a Microsoft account, which you probably already have if you are a Windows user. Teaching responsibility with technology and providing accountability is made easier with Windows Family Safety. Visit https://account.microsoft.com/family/about to learn more and get started and see if Windows Family Safety can help your family.